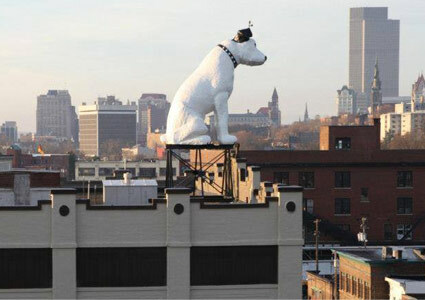 Nipper has faithfully watched over Albany for nearly 60 years from his perch on top of 991 Broadway. In 1958, RTA, a former RCA product distributor, moved into the building and placed Nipper on top. RCA has long used Nipper in their advertising. Nipper was a real dog that lived in 19th-century England. He was immortalized in the Francis Barraud painting, His Master’s Voice, which showed the dog listening to a gramophone. His image went on to become an international symbol for a number of audio recording companies, including RCA. For more than a decade, Albany BID has run the outdoor Placemaking program, formerly known as “Sculpture in the Streets”. The program has brought local and internationally renowned artists’ work to the streets of Albany. Previous installations include giant Dutch clogs and customized pianos from Luke Jerram’s Play Me, I’m Yours series. This year’s installation includes 20 three-foot statues of Nipper customized by regional artists. 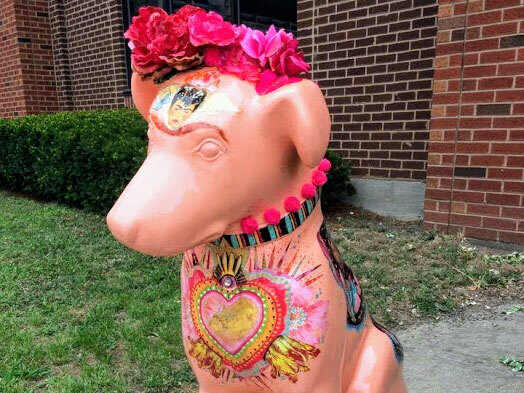 The litter features pups like Frida Fido by Betsy Gorman, Tulip Festival by Stephen and Harriet Myers Middle School, and Lost and Hound by Kit Collins. Many statues incorporate area history and landmarks in their motifs. You’ll find statues installed from Clinton Avenue to Madison Avenue stretching east from Eagle Street. Downtown is Pawsome is on display through May 2018. After the exhibition, the statues will be auctioned off to raise funding for Albany Downtown BID and the Placemaking series.